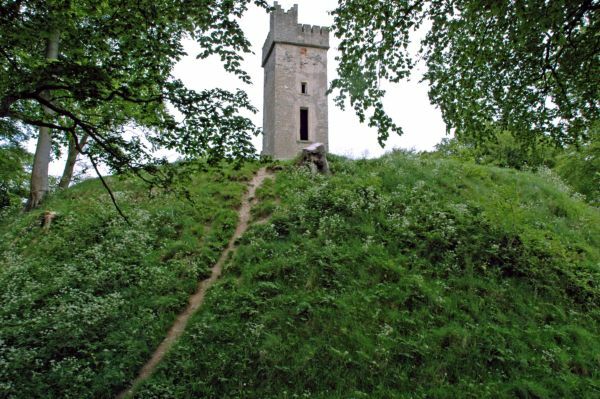 The ruin of a late 18th century castellated house known as ‘Byrne’s Folly’ stands on top of the mound. It was built by Patrick Byrne, a well-known pirate, in 1780 ad. The motte is built on the site of a pre-Christian fort called Dún Dealgan, meaning ‘The Fort of Dealga’. This site is important in Irish mythology as it is said to be the birthplace of the legendary warrior – Cúchulainn. The standing stone that supposedly marks his burial can be seen in the field to the right as you go up the entrance lane. Access: Requires climbing over an old stone stile in the stone wall at the entrance. The site is located on ‘Mount Avenue’ on the western edge of Dundalk Town. Mount Avenue lies on the south side of the N53 Dundalk to Castleblayney road, 2km from Dundalk town centre. To find Castletown Motte and its folly take the junction 17 exit of the M1 for Dundalk (Town Centre) onto the N53. Drive for approx. 800m until you reach a crossroads. Turn right at the crossroads onto Mount Avenue. Drive for approx. 200m and you will see a gate with stone pillars on your right. You will see the stile in the wall to the left of the left hand pillar. Just follow the track up to the Motte.